Tracheostomy is a common artificial airway in the operative room (OR) or intensive care units for maintaining airway patency. Patients with tracheostomy are generally considered with a “secure” airway and would be preoxygenated before anesthesia induction. However, there are some pitfalls for an anesthesiologist when confronting with tracheostomy management. As a crucial component for ventilation, any management of tracheostomy should be conducted prudently. 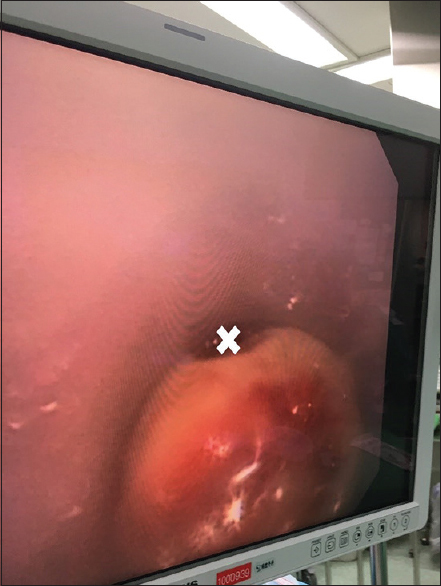 We report a case with tracheostomy presented to OR with loss of capnography but fair oxygen saturation which proved to be tube dislodgement by fiber-optic bronchoscopy timely without further desaturation. Tracheostomy is a procedure creating a surgical opening into the trachea which provides better and efficient ventilation. It is often performed for multiple indications including airway obstruction, loss of airway protection, or chronic respiratory failure requiring long-term ventilator support., Various postoperative complications of tracheostomy had been reported and could be divided into two categories: early and late postoperative phase. Hemorrhage, tube obstruction, dislodgement/decannulation, subcutaneous emphysema, and infection are included in the early postoperative phase. Complications in late phase included tracheal stenosis and fistula formation (tracheal-cutaneous or tracheal-esophagus fistula). Complications are uncommon but some can be lethal., We describe a case with tracheostomy tube dislodgement during transportation to the operative room (OR) that was detected by absent waveform capnography before anesthesia induction. A 61-year-old male, who suffered from gingiva cancer and underwent wide excision and tracheostomy 2 weeks ago, was scheduled for wound debridement. The tracheostomy tube was attached to ventilator for preoxygenation before anesthesia induction. However, capnography displayed absent waveform despite excluding mechanical errors. The patient presented with relatively small but steady tidal volume (150–200 ml) and pulse oximetry revealed fair oxygen saturation (96%–97%). His blood pressure was 138/70 mmHg, and the respiratory rate was 14–16 breaths/min. Bilateral breathing sounds were clear with chest wall partially expanded symmetrically. On airway examination, tracheostomy tube was protruded beyond the skin about 2 cm [Figure 1]. The cuff of the tracheostomy tube was deflated. There was no improvement in the tidal volume or pulse oximetry, and end-tidal carbon dioxide (EtCO2) was still absent when the cuff inflated. Partial obstruction, dislodgement, or decannulation of tracheostomy tube was impressed. 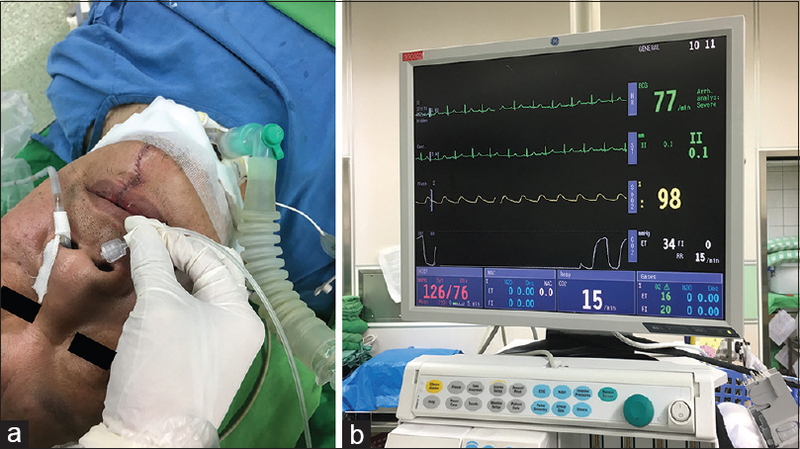 To confirm our suspicion, the nasal EtCO2 sensor was substituted for tracheostomy site [Figure 2]a, and capnography showed steady waveform thereafter [Figure 2]b. A chest surgeon was consulted for the evaluation on possible malposition of tracheostomy. Fiber-optic bronchoscopy (FOB) revealed the tip of the tube lay within a false passage anterior to the trachea with partially attached to tracheostomy orifice [Figure 3]. The tracheostomy tube was dislodged during transportation to OR. EtCO2 was absent due to one-way valve formation at the tracheostomy tube orifice. Positive pressure was provided through hand-assisted ventilation which prevented the patient from desaturation due to partial inflow forced by positive pressure and partial flow through the upper airway. 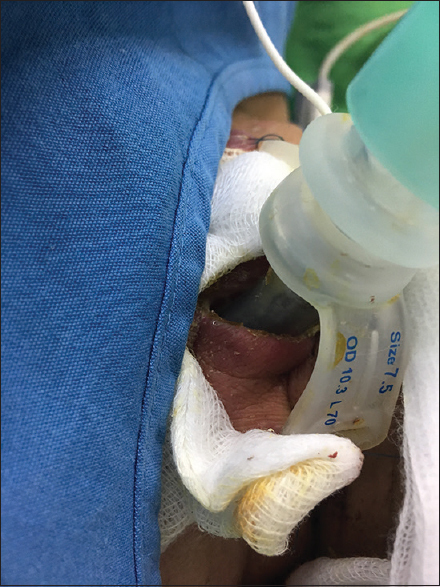 Negative pressure following released bag caused the flap of trachea ring to flip back and seal the tracheostomy tube orifice. 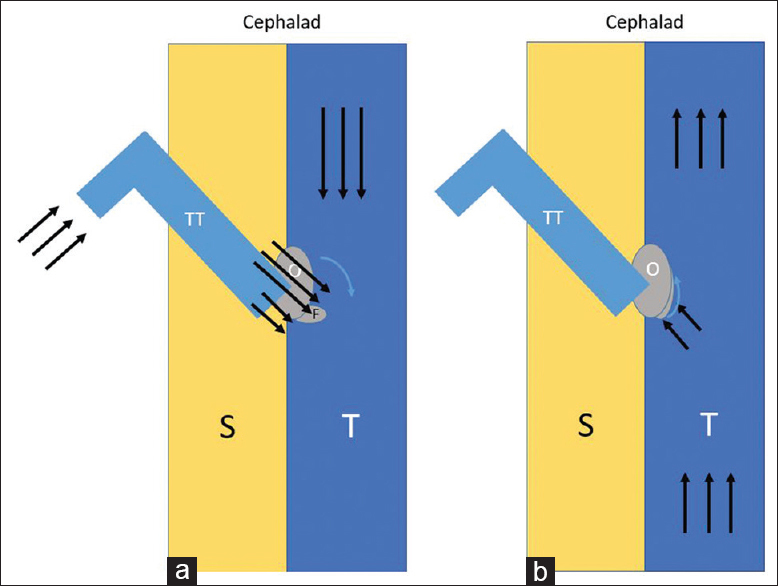 The exhaled air traveled through sealed trachea upward and was detected by nasal EtCO2 detector [Figure 4]. Tracheostomy reposition under bronchoscopy was conducted, and EtCO2 was observed. Induction of general anesthesia with intravenous propofol (Fresfol 1%) and maintenance with desflurane were performed subsequently. Capnography is a continuous measurement that provides both graphic display and numeric value of CO2 throughout the respiratory cycle. Although there remain limitations including the challenges of interpretation in patients with mixed pathophysiology, false-positive or false-negative CO2 detection in certain clinical settings, and only available in specific critical care units, it is still widely used for real-time and noninvasive monitoring of CO2. When loss or disappearance of EtCO2 levels and waveform, dislodgement or disconnection of tracheostomy tube should always be considered even though patient presented with fair oxygen saturation. Obtain indication and exact date of tracheostomy to assess the upper airway and stoma patency first in case of subsequent emergencies requiring oral intubation. Meanwhile, look for any respiratory distress signs such as dyspnea, accessory breathing muscle use, and stridor with caution. Evaluate tracheotomy in appearance and complete physical examination thoroughly. The cuff is supposed to be deflated for minimizing airway resistance and enables upper airway ventilation. Reduction in tidal volume and increased ventilator airway pressure are also indicators for possible tube displacement. If the patient was stable with good oxygen saturation, exclude mechanical errors such as EtCO2 detector dysfunction or disconnection to the ventilator. Pass a suction catheter through tracheostomy tube to confirm its patency. If the suction catheter failed to pass through, dislodgement or decannulation, partial or total obstruction of tracheostomy tube should be considered. To differentiate possible tube dislodgement, anatomic abnormality, or tube obstruction, chest surgeon or otorhinolaryngologist consultation for FOB evaluation is necessary in this setting. Once the tracheostomy tube is dislodged or decannulated, tube replacement under FOB is a rather safe management. Stoma ventilation with laryngeal mask if chest surgeon or otorhinolaryngologist was not available and the tracheostomy is partially obstructed. Once desaturation develops despite managements above, the choice of oral intubation or surgical airway should be based on the previous assessment of the anatomic structure of the upper airway. For a patient with tracheostomy, the absence of capnography from tracheostomy tube is an indicator of tube dislodgement. Tube dislodgement can be discovered in this setting and should be managed promptly for preventing further desaturation. Long B, Koyfman A. Resuscitating the tracheostomy patient in the ED. Am J Emerg Med 2016;34:1148-55. Morris LL, Whitmer A, McIntosh E. Tracheostomy care and complications in the Intensive Care Unit. Crit Care Nurse 2013;33:18-30. Goldenberg D, Ari EG, Golz A, Danino J, Netzer A, Joachims HZ, et al. Tracheotomy complications: A retrospective study of 1130 cases. Otolaryngol Head Neck Surg 2000;123:495-500. Long B, Koyfman A, Vivirito MA. Capnography in the emergency department: A review of uses, waveforms, and limitations. J Emerg Med 2017;53:829-42. Halum SL, Ting JY, Plowman EK, Belafsky PC, Harbarger CF, Postma GN, et al. Amulti-institutional analysis of tracheotomy complications. Laryngoscope 2012;122:38-45. Shah RK, Lander L, Berry JG, Nussenbaum B, Merati A, Roberson DW, et al. Tracheotomy outcomes and complications: A national perspective. Laryngoscope 2012;122:25-9. Spataro E, Durakovic N, Kallogjeri D, Nussenbaum B. Complications and 30-day hospital readmission rates of patients undergoing tracheostomy: A prospective analysis. Laryngoscope 2017;127:2746-53. Wetmore RF, Handler SD, Potsic WP. Pediatric tracheostomy. Experience during the past decade. Ann Otol Rhinol Laryngol 1982;91:628-32.